You Want A New Landscape For Your Home Or Business! We can help you with the process to create a meaningful and memorable landscape. We are in the business to help you grow one of the most visible places around your home or business. The process is fun, and can happen . 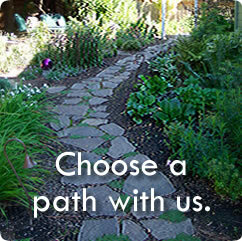 . . just choose a path with us, we want to help! Has been in this area for more then 25 years. We like to think that our customers make us successful because they keep asking us back. We have assembled our staff from some of the most trusted-trained professionals available. We have well over 100 years of combined design experience to draw from. That is a lot of hard knocks, but add to that the fact that all of our landscape managers have a college degree and you have a formula for success. Creative designs, quality materials and time-proven construction methods set our landscape designs apart from others. Our approach to design-build always includes strong ties to customer needs. We will develop solutions tailored to fit your landscape.